With this exciting opportunity comes a necessity to establish industry ethics and guidelines. 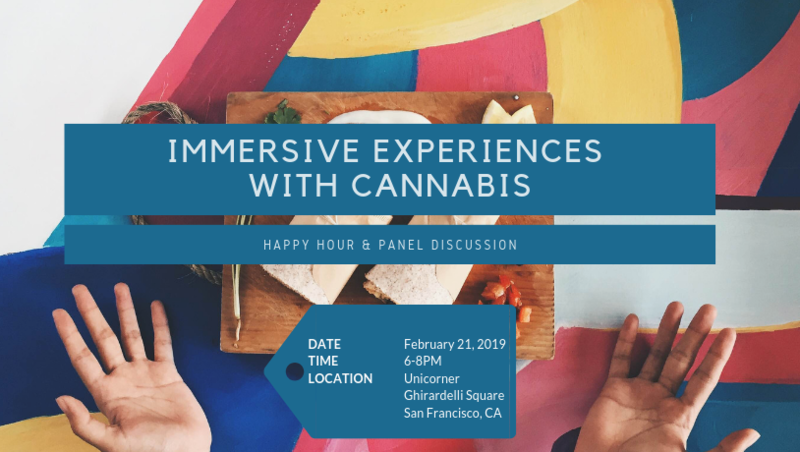 As California expands beyond “medical” to “recreational” cannabis use (perhaps best demonstrated by the shift from doctor-recommended to artist-facilitated), we must ensure that we simultaneously care for the safety, integrity, and wellbeing of experience-seekers. From detailed dosing education to clear consent practices and beyond, we will discuss the ongoing development of best practices. Join us for a conversation on where we are at in this exciting field, where we are going, and how you can get involved. 851 Beach St, San Francisco. Then, you will be dropped off right in front of Culinary Artistas. Take the staircase to the right of Culinary Artistas. Walk up two flights of stairs and Unicorner SF (event location) will be located on your left. Across from Unicorner is an arcade. If you get lost, ask for where the Arcade is (we are next to the arcade) and look for the Unicorner sign on the window. Chief Alchemist and Co-Founder of NEWERA, a Conscious Entertainment company producing pop-up events in the Bay Area. NEWERA's mission is to evolve the ways we connect and elevate, together. Since 2017, NEWERA has produced 14 events that pair cannabis with entertainment that leaves the attendees feeling rejuvenated, replenished, and connected with a community. Prior to starting NEWERA, Jessica spent her career in risk mitigation consulting for companies such as Blackrock Financial, United Airlines, OfficeMax and Salesforce. She's also led the Women's Network at Salesforce and led the Diversity and Inclusion program at Salesforce. CEO & Co-Founder of NEWERA. Prior to NEWERA, Cynthia co-founded a creative, community space in San Francisco called, The Laundry. Before venturing into producing events, she spent 7 years at Google and YouTube optimizing revenue for online publishers such as wsj.com, sfgate.com, and washingtonpost.com. Within YouTube, she led the charge to build out the live streaming platform and produced multiple live streams of music festivals such as Bonnaroo and Coachella. Policy & Advocacy Counsel at MAPS. Ismail currently works as Policy & Advocacy Counsel for the Multidisciplinary Association for Psychedelic Studies (MAPS), where he provides professional support for a variety of legal, educational, and community-building projects. He earned his J.D. at the UC Berkeley School of Law in 2016, and has previously worked for the ACLU of Northern California’s Criminal Justice and Drug Policy Project, and for the International Human Rights Law Clinic at Berkeley Law. Ismail also presently serves as Chair of the Students for Sensible Drug Policy (SSDP) Board of Directors, and participates on the Steering Committee of the Ayahuasca Defense Fund, all while producing an in-progress documentary about trauma, healing, celebration, and psychedelic medicine, called Cura. Ismail believes that psychedelic consciousness is a crucial piece of challenging oppression in all of its forms. Development Officer at MAPS. Liana builds awareness and fundraises for MAPS, the largest non-profit investigating the therapeutic uses of psychedelics. In addition to her role at MAPS, she is engaged in transformational technology movement, with an interest in VR/AR therapy and emergent blockchain technologies. To highlight the connection between the psychedelic and cryptocurrency community, she instigated the formation of CryptoPsychedelic, an event series that kicked off last February in Tulum and gathers together these communities all over the globe.